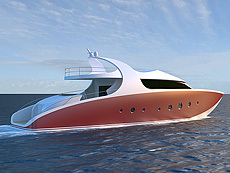 I'm working as designer for the yacht- and boatbuilding industry since 2004. I'm creating individually styled designs for your custom made yacht and develop a shape perfectly suited to you preferences and visions. 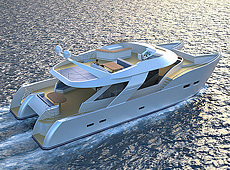 Accompanying, deck layouts and intelligent solutions for the interior are developed. 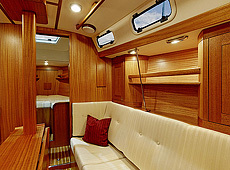 Yachts that have become a bit "aged" and need a refit are taken care of by me as designer. I support your design team during challenging phases of the development process. If necessary, I work in-house together with your crew while the designing takes place – or until production is up and running. I’m offering naval architects my support regarding aesthetic issues. Sometimes, a second opinion about visual aspects of a design and the help of someone who optimizes the harmony of lines and shapes surely is helpful. Of course I joyfully take part in a project right from the beginning to be able to contribute from my experience. If wished, I create photorealistic 3D-renderings from 2-dimensional drawings. 3D-models are created using Rhino3D. Thereby, exchange of data with other software used in the yachting industry is possible seamlessly. My scope of work also covers the design of interiors. As industrial designer I’m educated in the efficient usage of materials and technologies. Have a look at my portfolio and get in touch if you are interested in my service.